Hello friends welcome to the Best Files Hidden App For Android. We are calling this trick best cause of nobody couldn’t imagine that is a file hidden app. We are going to share the trick on how to hide important files and folders inside calculator app on Android device. Most of our people are now using android phone. Everybody has it’s own file on their device and they don’t want that somebody else access their personal files. Suppose you have some friends and when they want your phone you can’t refuse them. We know that you have to give the phone to the person. If you are in that situation and want to get rid out of this problem then you are at the right place. We will show you how to hide files easily on your android device. We are going to use “Smart Hide Calculator” which is a fully functional calculator app but with a little twist. 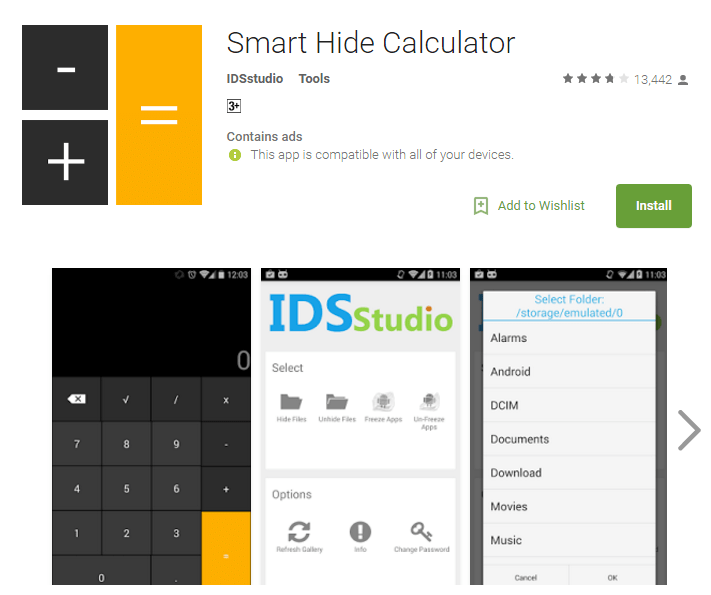 We are going to use Smart Hide Calculator which is a fully functional calculator app but with a little twist. Yes friends ! we are going to show you the trick about a calculator. This calculator is a fully functioned calculator but at the same time with a little twist. This app is actually a vault where you can store videos, documents and pictures. You just need to setup a password to use it. This is very interesting. Let’s know about it. Now search Smart Hide calculator on search bar. Now open the app and you need to set a password for using this app. You have to remember the password cause this is the password that you will use to unlock your hidden files. After that it will ask you for a optional password that will help you if you forgot your main password. After you confirmed the password, you will see the fully functional calculator app on your screen. Now how can you use it ? Just launch the app and Enter your password and tap on Equal button ( = ). After that it will show you some options likes Hide files , Unhide files etc. Now you have done. The app will show you your files to hide or unhide. You can hide you personal files easily and nobody will know that this calculator is a hidden app. And most important thing that your files will safe on your device. Now you know smart files hide trick. Hope you like it.